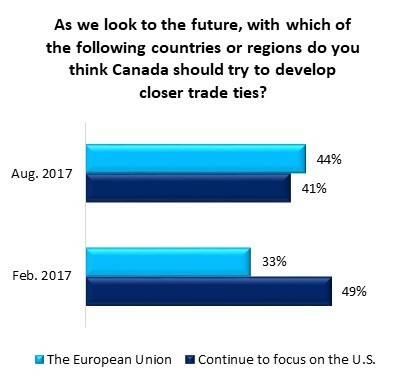 Sept. 11, 2017 - As negotiators for Canada, the United States, and Mexico revealed last week they’ve made little progress on revising the North American Free Trade Agreement (NAFTA), the latest public opinion survey from the Angus Reid Institute finds Canadians increasingly looking to partners other than the U.S. to safeguard international trade. In the last seven months, as U.S. President Donald Trump has repeated protectionist rhetoric and threatened to “terminate” NAFTA if current talks don’t go his way, Canadian opinion has shifted away from deepening trade ties with the United States, and toward a stronger relationship with the European Union, where a free trade agreement with Canada was ratified earlier this year. Asked which countries or regions Canada should seek a closer relationship with, the number of Canadians saying “continue to focus on the U.S.” has fallen eight percentage points (from 49% to 41%) since February. In the same time period, the number expressing a preference for the E.U. has grown by 11 points (from 33% to 44%). Download .PDF (947 KB) with detailed tables, graphs and methodology.